The Student Association will vote on the formation of a Beer Bike Best Practices Working Group at senate next Monday to conduct research on student opinion regarding possible changes to Beer Bike. Beer Bike is organized by the Rice Program Council, which has jurisdiction over planning the event. 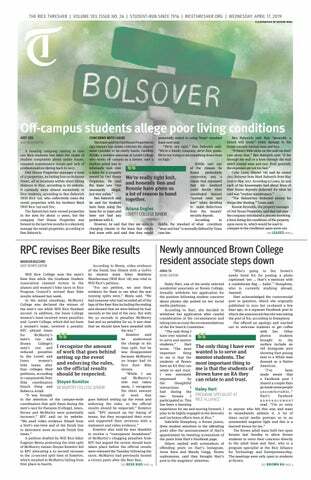 The working group would submit their research to RPC, according to Ashton Duke, the 2017 campus-wide Beer Bike coordinator who introduced the bill. Joyce Moon, 2018 campus-wide Beer Bike coordinator, said she is concerned about a working group connected to the SA as opposed to RPC. “Even if it is passed and advertised as a research-only group, some people may see ‘Beer Bike’ and ‘SA’ and think that, because it’s associated with the SA, the student body will have a say in what happens with the logistics of Beer Bike, when, in reality, it is completely up to the campus-wide Beer Bike coordinators,” Moon said. Moon said ideally, a working group would be formed under RPC to ease communication between it and the committee, but this would be difficult because RPC has already begun its timeline of event planning for the year. Eli Mensing, a Baker College senator, said he is concerned by the working group’s structure but appreciates proactive efforts to examine potential changes. Mensing said a working group should allow students to easily share their feedback. Duke originally introduced Senate Bill #3 in April following unofficial proposals that arose after a meeting with Beer Bike captains and experienced bicyclists regarding biker safety, according to the 2018 campus-wide Beer Bike coordinators. The Thresher reported that the campus-wide coordinators ultimately decided against them amid debate, citing an inadequate feedback process. The proposals addressed changing the order of events, reducing the number of people on each biking and chugging team and allowing adult teams to bike on their residential colleges’ alumni teams. The working group would consist of a member of every college, two members from the Graduate Student Association and a member from the Association of Rice Alumni. If the proposal passes, the application would be open to all students and would be due the following Friday.